Visiting a place like Myrtle Beach, you have your share of tourist guides. 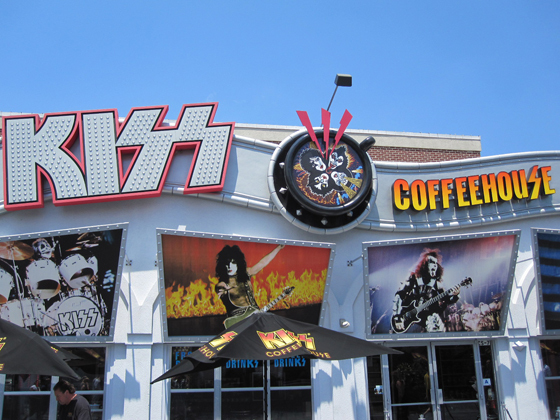 In one of them, they had an ad for KISS Coffeehouse. It looked real, it had the official logo and images of the band members. It had to be legit. 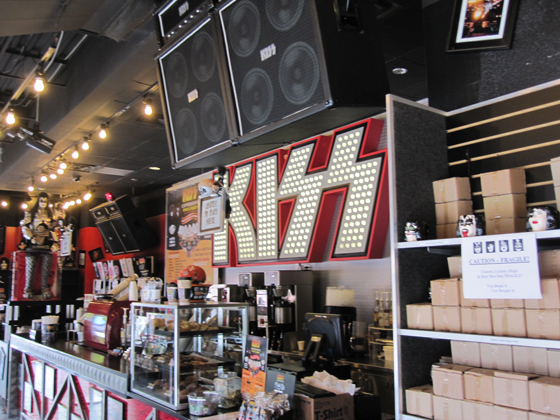 If there was going to be a music-themed coffee shop, leave it to the mass marketing machine known as KISS to create one. Only one way to find out. Walking up to the store front, it was obvious this was no ripoff. The decor was very cool. 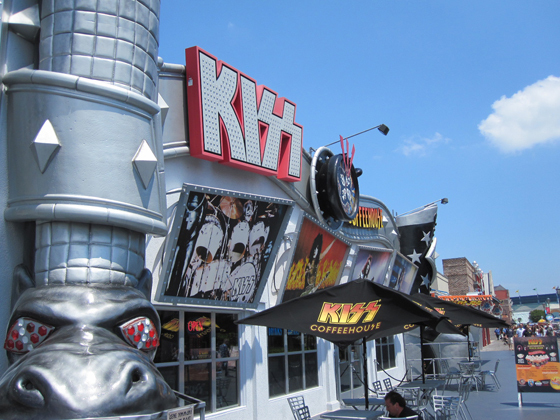 All sorts of KISS designs and the logo plastered all over. Tables with umbrellas are standard fare for any coffee shop, only with the KISS logo at this java hut. Their specialty drink is called a “rockuccino” which is pretty much a frozen cappuccino drink. I tried it and it was actually really good. Tasty, not too sweet and refreshing on an 82 degree day. It was $6.50 (including tax), which is steep even compared to Starbucks, but hey, this is their only location and it was a novelty thing, so there’s that. I’m no Gene Simmons, but I’m giving it my best shot. So if you find yourself in Myrtle Beach, check it out. If you are a KISS fan, you’ll love it. Otherwise, there are plenty of other coffee shops to get your daily fix of morning joe. Rock ‘n Roll All Nite!! For $6.50, that thing better make me shoot flames out of my mouth! That’s cool, I didn’t know they had their own coffeeshop. Mind you there isn’t much out there without a Kiss logo on it so I’m not unduly surprised. Very cool…including the tongue action!! !